The voice from the next booth, in the elegant Sur le Pont d’Avignon, belonged to Norm’s old nemesis, “Dirty Dutch” Vander Molen. The baseball story Dutch was telling, in a loud, not entirely sober voice, pulled Norm’s mind back to Columbus and 1975. “So there I was,” Dutch was saying, “pitching for the Mud Hens against the Tigers in an exhibition game. It was the top of the 13th, score tied, 4-4, no outs, bases loaded, when the manager called me in to pitch. I was the bottom of the barrel and knew it. But he’d used up all his other pitchers. “‘This will be painless, kid,’ Kaline said to me as he came to the plate. “With the infielders in for a play at the plate, I threw my best fastball, tight and low. Kaline swung and drove a sinking line drive down the left field line. The third baseman, close in for a play at the plate, caught it just before it hit the ground. One step took him to third, for out number two. A sharp throw to second got out number three, when that runner slipped getting back to the bag. “I couldn’t believe my luck. Teammates swarmed me as I raced back to the dugout. I figured I was done for the day. “‘Get out there, kid! You’re up to bat,’ the manager hollered at me. He replied gruffly to my disbelieving stare. ‘Got no more pitchers,’ he said. ‘You gotta bat so you can pitch next inning.’ This was before the days of the designated hitter. So I looked around for a bat, and the bat boy finally came up with one for me. In Columbus, in 1975, Norm worked as undercover cop. He was sitting in a bar on North High Street, having tailed a suspected drug-dealer. The guy was in the next booth, reporting in a high-pitched voice to someone higher up, whom Norm hadn’t been able to get a look at. After the dealer made his report, the higher-up ordered drinks and started telling baseball stories. About the time the guy finished the story, a fight broke out in the bar. The crooks disappeared during the disruption. Later that night the police had found the body of the suspected dealer in the alley behind the bar, with a bullet in the back of his head. It turned out that the guy was actually an informant for the police, named Duane Fedders. Fedders worked with a detective named Louie Franklin. The police never did figure out who the hit man was. Louie always blamed Norm for what happened. “No work tonight,” Gerry said. She knew about Norm and Dutch. She occasionally tried to convince him that it was a vendetta he should drop. It wasn’t consistent with loving his enemies. But for Norm it wasn’t a vendetta. It was about justice. Later, as they left the restaurant, Dutch was standing near the door, smoking. “Ev’nin’, Norman,” he said. Short and slight, with dark hair and eyes, Dutch was always well dressed, always careful to look the successful businessman rather than the gangster. “Yeah. They did somethin’ to my heart. But don’t get your hopes up. Take more’n that to get rid of me. You come up with any more dirt on me lately?” asked Dutch. Norm and Dutch went way back—to one of the first days in kindergarten, when they got into a fight. They had been antagonists all the way through high school; after high school their paths separated. Norm had gone off to Calvin College and then the Columbus police. Dutch had signed a baseball contract and started working his way through the Tigers’ farm system till he ended up with the Mud Hens. In 1980 they both moved back to Maasdam, Norm to start his PI business and Dutch to start building his own organization. Dutch knew that for 35 years Norm had been trying to get the goods on him, and Norm knew that he knew. 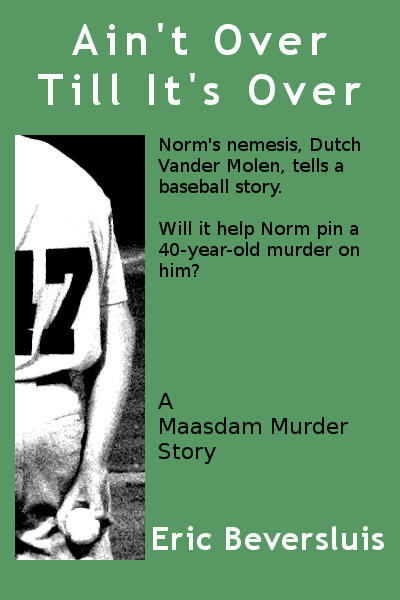 Early on, one of Norm’s contacts was murdered; Norm was sure Dutch was responsible for the murder. But there had been no solid evidence. Over the years he watched in frustration as Dutch’s criminal career dodged the law. She didn’t press further. He left her to enjoy the Christmas lights on the drive through town and through the Maasdam College campus, while he considered how he could use what he had heard. Gerry parked the car in the garage of their 1950s ranch-style. Normally they would have continued their date; tonight Norm headed straight to his study in the third bedroom of the one-story house. He was mad at himself for not having recognized Dutch’s voice that night so many years ago. But, of course, it had been fourteen years since they had last crossed paths. Norm’s study was his hermitage. Gerry rarely came in and the cleaning service never. Clients came to his office, not here. The Steelcase desk had been top-of-the-line in 1980 and still looked good, but the vinyl on the “executive” desk chair had popped its seams in a number of places. Only a photo of his daughter and her family sat on the desk. A police scanner sat on a shelf over the desk. For about 10 years now, virtually all of his “paperwork” was done with his laptop, but he still had several file drawers of old files. He did all his thinking and reading here. He rummaged through the file drawers till he found his old notes on the Fedders case. He also pulled out his bulging file on Dutch and studied it for a long while. His notes on the Pantlind Hotel murder particularly bugged him, since the D.A. had been unable to convince the Grand Jury that Dutch was connected with either. He called Carlos, an old buddy from the Columbus police. Norm hadn’t talked to Louie since leaving the force. He wasn’t eager to talk to him now, but he knew that Louie was better connected in the Department than he or Carlos. Carlos gave him the number. After a bit of a chat, he called Louie. “Not saying that at all, Louie. I know you’re a good detective. Just offering to make sure it’s a good lead for you.” Norm knew which buttons to push. That’s interesting, Norm reflected. Dutch wouldn’t react that way if there was nothing to this. Impressive that he learned about it so quickly. The guy’s got a good organization. Including apparently at least one person in the Columbus PD. Carlos called back. As far as he could tell, nothing was happening. Hanging up, Norm pounded the desk. Come one, come on! We’ve got him now! Then he pulled out his file on Dutch. What do I have on Dutch in 1975? It wasn’t much. He had begun his collection on Dutch after returning to Maasdam. Now he was mad at himself for not having filled in more about the years before 1980. He had to proceed carefully. Dutch knew he was trying to link him with the Columbus murder, so he’d have to be circumspect lest he put his informants in danger. Some phone calls to contacts, asking general questions about mid-70s organizations—his contacts didn’t have to know exactly why he needed this info—turned up enough references to Dutch to confirm his history as an enforcer with a local drug-dealing group. Norm had nothing to say. Gerry was right, but, really, she wasn’t right. She just didn’t understand. The next morning the newspapers reported that Stanley “Dirty Dutch” Vander Molen had died during the night—heart attack. Norm stared at the photo of Dutch, while eggs and bacon got cold on his plate. He knew he shouldn’t feel so cheated, but . . .
Gerry saw his frustration. “It’s in God’s hands, now,” she said.